For some reason, making people speak like country bumpkins was deemed good humor back in the early to mid twentieth century. To wit, Li'l Abner, Snuffy Smith, Barnet Google, et al, had characters that made the Beverly Hillbillies look like Rhodes Scholars by comparison. 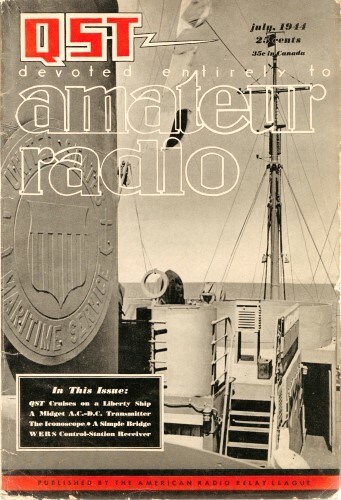 This fun story in the July 1944 edition of QST is no exception. Enjoy. Ed Thiddleslug lives up at the head of Catfish Pond. He's an old guy and we don't never see him except when he comes down to sell his syrup after the sugarin' season. He come down this year same as ever. While we wuz settin' around waiting for the grading to get finished, Ed had his annual say. Every year he gets off about the same story as last year and the year before on the topic of "Them Wuz the Good Old Days." We ain't got the heart to douse the old fool, and so we just let him maunder on till he runs dry. After all, it's only 'once a year, and I guess it's about the only fun Ed gets outta life. Reason Ed comes into this story is because after he left Martha and me began talking over them old days, too. Far as Martha is concerned, she reckons that the only good thing about 'em is that they are gone. That's easy to figger out, what with modern washing machines and all making life easier for the wimmen folk. 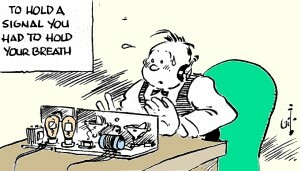 As for me, guess I'm old enough to remember the early days of ham radio but young enough so I don't live in' em. After reading back through my file of QSTs (bless the day Martha bullied me into having 'em bound each year) and getting out some of the old log books, I come to the conclusion that them was the good old days at the time, but that they look kinda sad in the light of what we know today ­ and didn't know then. Looking back sorta puts a haze over the things that weren't too good and makes the good times stick out clear. .
You take that sync spark transmitter we had up here about twenty years ago. It sure was impressive. By golly, that old blast furnace would reach out as much as 800 miles on a good night! It put out a strong smell of ozone and shoved a solid 14 amperes into the aerial. Brahms never wrote a rhapsody as sweet as the music of that gap. Them things I remember clear. But now let's dig around in the haze a bit. When I used that rig the Polecat County Electric Company used to blame me every time there wuz a surge back up the line. The neighbors weren't rightly interested in my QSOs and they took a nasty view of flickering lights. 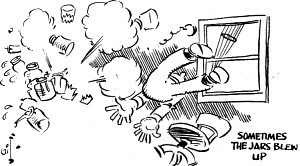 And when the power bills came in at the end of the month ­ whew! Them sure wuz good days at the time, but I'd ruther have that prewar 250-watt rig and no ozone. Come the end of the war we'll sure have a better one, too. 'Course, there wuz some things about them early days where there warn't nothing down in the haze - it was all good. When there was only a few fellers on the air we were so glad to see each other that everyone was real nice to everyone else. Messages got slapped through best a feller could do. There warn't so much of fellers shouldering each other outa the way and riding the next guy down just to make a DX QSO. Competition is a fine thing but, like most fine things, it can be carried too far. A DX contest is really a high-power radio Olympic Championship contest. Every feller should playas hard as he knows how without beating the rules. Seems like a lot of fellers was running a permanent DX contest in the last couple years before the war. They used to use ECO swooshing as a spearhead attack and their heavy artillery was an oversize kilowatt. When they got all through they'd blasted some little guy handy to them with their ground wave and ruined the tempers of a dozen other guys around the country. The result wuz a single QSO with a DX station and a card later - mebbe. Ain't nothing against high power s'long as it's used decent-like, but it ain't right to abuse it. One of the brightest moments wuz the first time I stoked up the Reinartz receiver. Before then we used a perambulating tickler coil. My set had a whole raft of Meccano parts to make a reduction gear (about 2000 to 1), but no matter how a feller strained and grunted the doggone thing would go plop into oscillation just at the time when the signal was crawling up outa the hash. That job of Johnny Reinartz's we copied religious-like outa QST. Seems silly today, but all it amounted to was reaction control with a variable condenser instead of a rotating tickler coil. Didn't seem silly when I first switched it on, though. As the feed-back condenser eased around the set slid smooth into oscillation with a gentle rushing noise. You could build her up right to a knife edge of oscillation and just a leetle past ­ and out come signals like you never heard before. The Reinartz receiver then was like stepping out of a Model T Ford into a Rolls Royce, but it sure would look sick today. F'rinstance, if another station opened up within a megacycle or so of the one you were listening to that detector bottle got a snob complex and pulled itself over to the stronger of the two. On a very weak DX signal you had to hold your breath and keep your nose from twitching; otherwise the body capacity would change the tuning and lose it for you. Bet TOM's cat got spat on for that more'n any other reason! You young fellers who never knew nothing about the old detector-one-step rigs don't know how well off you are. And I reckon it's safe to assume that after the war we'll have better receivers than ever before, too. Some of you old-timers will be interested in what I heerd t'other day. Young city slicker up from Washington told me that the original John Reinartz has got three stripes on his sleeve and scrambled eggs on his hat now and is in the Radio Division at the Naval Research Laboratory. Reckon that guy ain't changed much. Didja ever notice that fellers who have been doing ham radio for a long time don't seem to change much? They get older, sure - but they don't get stodgy and sot in their ideas. Reckon that planning that next rig what's always going to be better than the one you have now kinda keeps a feller young. Guess the durndest, fussiest, dirtiest, most divorce-making invention of Satan that the old­timers used was them chemical rectifiers. Right at the first we used just the raw a.c. on the plates and signals sounded like a cross between a bad-tempered hog at feeding time and a slow-speed band saw. Then along came the chemical rectifiers. To begin with you needed a truck to get the stuff together. Four or five dozen quart Mason jars was the minimum. Then you get some borax (I allus held that 20 Mule Team was the best ­ no advertisement intended). 'Bout twenty-five pounds wuz enough to start with. Next item was sheet aluminum and sheet lead. The lead you could come by pretty easy. 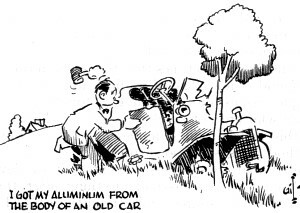 In the early '20s aluminum was rare stuff and the pure kind rarer. I got mine from the body of a junked foreign car a feller smashed up when he hit a tree down the road one time. The trimmings needed added up to a gross of nuts and bolts and a 2 X 4 frame ­ not to mention a bath tub! Had to be a bath tub that was enameled, too; a tin wash tub wuz supposed to be poison. Well, you lined all the Mason jars up on the rack - no lids on 'em, of course. Then you got a pair of tin snips and grew a crop of blisters cutting out strips of aluminum and lead, one strip of each for each jar. Then you connected 'em all up, aluminum to lead, like a battery. Next, them jars had to be filled. You got a lot of boiling water and made a strong solution of borax in the bath tub and then ladled some out into each Mason jar pretty near to the top. If you wuz real fancy you floated a little oil on top of the soup in the jars to keep it from evaporating and creeping. (It never worked!) If all went well you ended up with a bridge rectifier just like the copper-oxide rectifiers we have today. After making sure your life insurance wuz paid up, you connected the transformer secondary across one side of the bridge and hooked a lamp in series in the primary circuit to reduce the volts and save the fuses. Then you switched it on for a while. This was called "forming" the cells and was unpredictable as a six-month-old colt. Some­times she blew up; sometimes she boiled over. If luck wuz with you the plates "formed" and you had a rectifier. It wuz a swell rectifier then; why, the d.c. didn't have more'n about 40 per cent ripple! Them jars looked right pretty in the dark, too. They blowed - I mean glowed, but they did both - a nice, eerie blue light and there wuz little sparkles of light in 'em like some of you fellers seen in tropical waters. Swell- if only they hadn't crept. That's where the divorces come in. That dadgummed stuff would crawl outa them jars and go creeping around the house, crystallizing here and soaking there. You married fellers know the rest! Mebbe that sounds kinda glamorous - but it wasn't. Now today you take a couple of little old, bottles not much bigger than a receiving tube and shove 'em into a neat; clean, dry little power supply and out comes husky, fat, pure d.c., enough and to spare - and, by golly, you get the blue glow thrown in free! No! a thousand times no! Them wuz swell days then, Wouldn't have missed 'em for anything. But as the feller sez on the radio, "Time Marches On," and the guy who don't march with it is either dumb or ornery. Ed Thiddleslug can look back over his shoulder all he wants to, but you and me - we automatic-like look ahead to doing it better and neater. If we hadn't, ham radio would of dried up and blown away long ago.